Last week Fritjof Capra and I took part in a Sustainable Brands webinar in which we disccused was the way in which sustainability activism and the call for change in our thinking has evolved and developed over the last few decades. Fritjof sent me this photo for the slides which I put together for our conversation. It is an incredibly rare photo from Fritjof’s personal archive. It is from 1983 from a legendary conference in Apbach, Austria, on “Alternative Realities”. The picture shows (from left to right) Fritjof, Rupert Sheldrake, Richard Baker Roshi, David Bohm, facilitator, Dalai Lama, interpreter, Brother David Steindl-Rast, Francisco Varela. You can click on the photo to see a larger version. 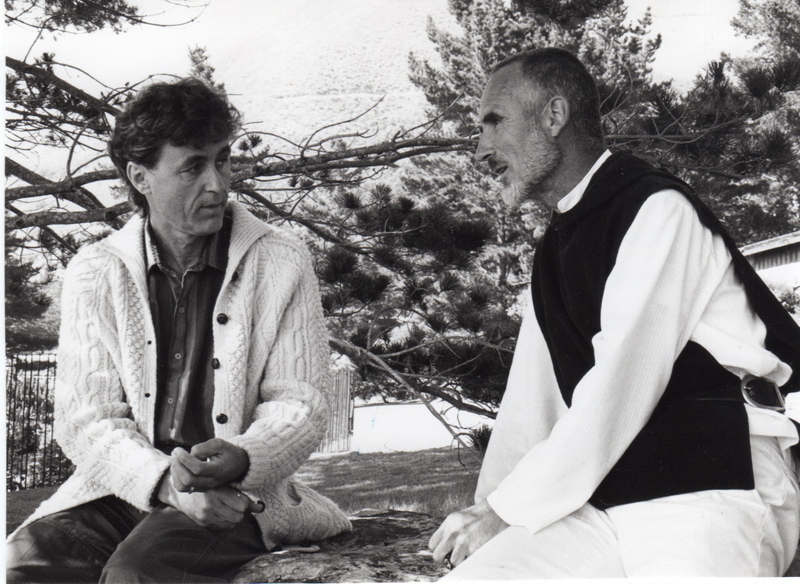 Fritjof also shared with me this photo of himself with Brother David Steindl-Rast in 1989 discussing their book Belonging to the Universe. Not only is Fritjof a distinguished scientist and systems theorist, he is also an environmental educator and one of the world’s most recognised enviromental activists, and so to open our webinar I had the chance to ask Fritjof how he had seen activism changing over the last few decades. The main change has been the emergence of a new global civil society — an international coalition of NGOs with their websites and social media that allow them to share information and mobilize their members with incredible speed. In my view, this global civil society has its roots in the counter culture of the 1960s. I am old enough to remember the sixties: we had a dream of an alternative culture: peaceful, spiritual, socially just, sexually liberated, and so on. But we didn’t know how to realize that dream, except for short times in various utopian communities. In the 1970s, our vision of the future became more concrete with the emergence of two strong movements, the ecology movement and the feminist movement. And in the 1980s these cultural movements took political shape when they coalesced into Green parties, first in Germany and then around the world. At the end of the 1980s we were at the cusp of what Bernie Sanders now calls a “political revolution.” But then something unexpected happened in the 1990s: the Information Technology Revolution, which brought us not only the freedom of the Internet, but also a new materialism and a new global capitalism, economic globalization, with unprecedented corporate power and disastrous consequences. It took the counter culture a full decade to absorb these developments, and in 1999 this new global civil society emerged in Seattle and declared its opposition to the so-called neoliberal ideology. Well, these are just some highlights of a long story of activism over four decades. While we have come a long way in relation to helping major organisations develop a more systemic view of the problems we face, we still have some way to go. I asked Fritjof at the end of the webinar what more businesses should be doing, and he summarised his points by saying how businesses need to make the shift from being “life-destroying” to “life-enhancing”. It was a very exciting webinar to participate in and there was a huge amount of discussion in the chat section with all of those taking part. The webinar will be available to listen to soon, so I will post a link when it becomes available. We did of course discuss Capra Course, Fritjof’s online course based on his book The Systems View of Life, co-authored with Pier Luigi Luisi. I thought I would take this opportunity to let you know that we are now half full, so if you are thinking about enrolling, please don’t leave it too long as a few people did not manage to get in for the first course in April which was fully subscribed. If you have any questions please feel free to ask.